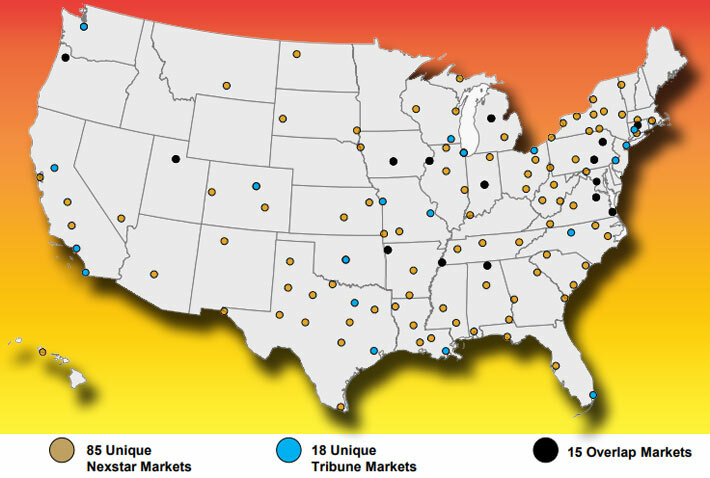 Nexstar and Tribune have overlapping stations in 15 markets, and to comply with FCC local and national rules and Justice Department antitrust guidelines, Nexstar would be required to spin off stations in at least 13 markets. The deal gives Nexstar an additional 12 tall broadcast towers. Nexstar Media Group, Inc. and Tribune Media Company announced today that they have entered into a merger agreement whereby Nexstar will acquire all outstanding shares of Tribune Media for $46.50 per share in a cash transaction that is valued at $6.4 billion including the assumption of Tribune Media’s outstanding debt. The proposed transaction will combine two leading local media companies with complementary national coverage and will reach approximately 39% of U.S. television households. 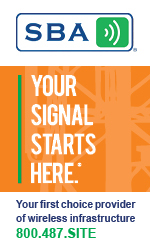 NexStar owns and operates 139 broadcast towers, according to Wireless Estimator’s Top 100 Tower Owners database, and will pick up an additional 12 as part of the Tribune buy, the tallest being 1,173-feet in Figure Five, Ark. Tribune Media’s diverse portfolio of media assets includes 42 owned or operated broadcast television stations in major U.S. markets; local news and entertainment content creation; significant broadcast distribution; a reinvigorated general entertainment cable network, WGN America; a 31% ownership stake in TV Food Network, which is a top tier cable asset; and equity investments in several digital media businesses.